Increased precipitation is expected with rising temps. Decreasing snow is expected with rising temps. Is this good enough Rob? “The vast, vast majority of tree ring data can not be used to reconstruct temperature. Most of it simply does not carry that signal. I think you mean that the carried data is too hard to dissect out from the other conflating values in most trees. So fortunately a small group of tree rings in an extremely specific location behaved in accordance with other proxies over an extremely specific time interval and though they have not shown this behavior since, in fact behaving as the vast, vast majority of trees have done over time, we can use them as a proxy for temperature. OK, It is Christmas . And they are bristle-cones. ” Between the science and a hard place Sunday, September 19, 2010 Probably the most famous “lukewarmer” is Lucia Liljegren, a mechanical engineer (surprise!) whose blog, The Blackboard, can be found on the blogroll here. The Blackboard entertains many lukewarmers, along with a bunch of deniers and a smattering of pro-consensus folks, including myself”. ?? Stewie Griffen at the idiot tracker. Interesting post on Climate Sensitivity in the past. The central estimate by itself is of minor interest for policy. “Better estimates for climate sensitivity are not necessarily all that relevant”. ATTP. And here I was being told Climate Sensitivity was an emergent property of models. This information is already known. Mosher said anyone can calculate the Climate sensitivity at the moment based on the data we have, but the different data streams available give a range of choices.He said if the pause continues Climate Sensitivity intrinsically becomes lower. There are different ways of estimating it. The generally accepted radiative forcing (RF) is 3.7 W/M2. One simply needs linear changes in global surface temperature change (?Ts) which can be estimated or measured in many ways. -Consensus estimates by committee 1979 Only two sets of models were available! 2 degrees and 4 degrees! – IPCC models which ignore observed climate change and use the known “feedbacks” simulated in general circulation models to calculate grossly inflated temperatures. Idso (1998) ] calculated a ? of 0.1 °C/(Wm?2) resulting in a climate sensitivity of only 0.4 °C for a doubling of the concentration of CO2 in the atmosphere. but his work is ignored as he only used 8 different methods to get this average. The same question in a different way Lucia. Given the emergent CS range on the climate models makes them so wrong on the observed temperatures can the “true climate sensitivity for each model be derived by putting in the temperature difference and backworking the emerged CS to give the one that was needd for that model to give the lower observed temperature. Finally the problem is that there is no one true climate sensitivity possible due to forcing changes like contributions due to solar activity, aerosols, ozone, and numerous other influences. But an estimate can be made by using simple measures of change in temp over time with the radiative forcing of increasing CO2. Note this means that when we have a pause in global temperature rise this means the Climate sensitivity for that period is actually zero by definition, [sorry Lucia]. If the temperature fell by definition the Climate sensitivity would be negative. While this is in essence a nonsense result as the fact is this would be due in the short run purely to natural variation the implication of a decade or 3 decades of paused or dropping temperature without other cause would alarm most scientists. It would say that the negative feedbacks are much greater than anticipated. It would say that the modellers have been very crass in their modelling for the consensus and it may be that a new much lower CS would be emergent, if not as the models failure shows, already emerged. the paper by Lewandowsky, Gignac, and Oberauer that was published in PLOS ONE in 2013, entitled The Role of Conspiracist Ideation and Worldviews in Predicting Rejection of Science Can be referenced from a link at Bishop Hill’s. No ad hominem attacks. Attacking other users or anyone holding a different opinion to you is common in debates but gets us no closer to understanding the science. For example, comments containing the words ‘religion’ and ‘conspiracy’ tend to get deleted. Comments using labels like ‘alarmist’ and ‘denier’ are usually skating on thin ice. I love Lewindowsky. Could you discuss these attitudes Judith? Argo And Ocean Heat Content The earth is closest to the sun in January, so the earth gains energy around that time, and loses it in the other half of the year. please QUOTE THE EXACT WORDS YOU DISAGREE WITH. Time for me to get on a hobby horse and get knocked off. I understand what you are trying to say but disagree with the concept. The energy in equals the energy out on a 24 hour basis. Hence when the earth is closer to the sun in January yes there is more energy in but also more energy out to balance. The atmosphere is naturally hotter as the sun is closer. But the earth does not retain more energy stored in the sea. Any heat that has gone deep is balanced by colder water elsewhere as the earth has to give up all the energy it takes in over the 24 hour cycle. If that heat went deep somewhere else had to radiate the equivalent back to space. Yes there are Kelvin waves, yes, there are pockets of down-welling hot water. But these do not store extra heat, they only carry heat that has already been balanced by the outgoing radiation from the rest of the sea and land. TOA is simply the heat in, heat out interface. Hence so called stored heat cannot come back to bite us. It has already gone back to space. ENSO and stadium waves and El Nino’s are simply descriptors of current weather patterns. Yes El Nino is real, the sea is warmer but there is no more heat in the system because of it. There must be more heat in the system causing El Nino. The simplest explanation for this would be altered albedo due to cloud cover. This lets more heat into the atmosphere which then heats up. More complex would be altered albedo due to atmospheric factors we have not taken into account. Choppy surface water in storms, dust storms, forest fires. or even factors in the sea which might cause increased reflectance off water. The last would be simple variance in the amount of energy emitted by the sun which we are reluctant to consider. angech, It is interesting how the deep ocean temperature varies. For there to be a reasonable steady state with the atmosphere, sea surface temperature has to vary with respect to the whole atmosphere not just the portion of the atmosphere above the actual ocean surface. The oceans have to “make up” for the land heat capacity short comings. So if you consider the ratio of ocean to the total surface area, the change in the 0-700 meter temperature looks a little bit different than the OHC for the tropical and sub-tropical regions. 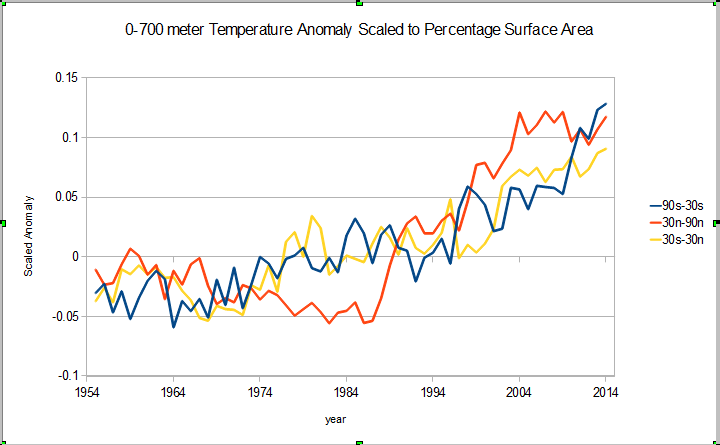 There the temperature anomaly is scaled to the ratio of ocean surface to total surface area for the three regions. The northern subtropics take about 10 to 20 years to catch up with changes in the rest of the oceans. There isn’t really enough 0-2000 meter data IMO , but that would take longer to “catch up”. Anyway, looking at just SST or just OHC changes without considering the surface ratios doesn’t paint a complete picture. The heat transfer from the earths core is minuscule compared to the heat output from the sun which is what warms our atmosphere. If the sun were to go cold the earth would continue to lose its own intrinsic heat at its own intrinsic rate. The amount of heat the earth itself emits would gradually diminish over time according to most scientists who assume that the core of the earth is cooling. You are mixing up total energy, sun plus very small earth with energy flow,very small earth out with imagination, cold sun plus very small earth out. There is a larger differential in surface temp of the cooler earth to the temperature inside the earth but the flow of endogenous energy (very small) from the earth core to the surface remains the same and will diminish in time as the earth’ score cools. Willis stuff is incidental to a concept I am trying to sort out. I was trying to understand how if the energy in equals the energy out on a daily basis, which should be the case, how everyone is missing the fact that we are not really warming or cooling on a daily basis as a planet. Yes we have hot and cold surface temperatures over a year but in reality, if the sun input does not change and the volcano’s stay average then the energy input equal output and the warm years are purely due to the atmosphere having more heat while other parts have less heat. So air heat content] plus sea heat content plus land heat content plus ice heat content equals x, if the air heat content is higher then some of the other 3 must be lower. Instead of looking for missing heat in the oceans we should be looking for missing cold. CO2 and GHG help keep the air heat content at a a certain level responsive to the solar energy passing through. The message is that no extra energy cannot be stored in the sea as energy in must equal energy out. Your contention that CO2 is a prime driver of the air heat content is true. My contention is that we have not allowed for what amount of energy is getting through for the GHG effect to take place. If albedo increases or the sun puts in less energy at times then the CO2 effect cannot be the cause of a rise in sea surface temps/air heat content. when the amount of energy it has to react to is less. *solar energy varies with elliptical orbit [proviso]. I think this concept that we are dealing with a chimera of climate change when the scientific reality is counter intuitive deserves a much bigger discussion. angech – energy in does NOT equal energy out on an hourly basis; on a 12-hour basis; on a daily basis; on a weekly basis; or on a yearly basis. Your confusion stems from the fact that on a 24-hour basis there is an approximate balance, 12 hours of warming, and 12 hours of cooling (all taken locally; globally it approximately evens out at all times.) There is a similar smaller but global effect of half-year warming when the Earth is closest to the sun, followed by a half-year cooling. So we have a 24-hour cycle and a 365.25 day cycle. Climate change is any change above these basic cycles. angech – P.S. Don’t confuse a half-year planetary warming and cooling (a global effect) with a summer-winter cycle, a local effect of a completely different origin. Curious George | December 6,angech – energy in does NOT equal energy out on an hourly basis; on a 12-hour basis; on a daily basis; on a weekly basis; or on a yearly basis. As one of the voices of reason on this blog, I appreciate your comment. The sun is the source of energy for the earth, basically. The sun’s energy is practically constant. The earth receives this energy which varies. A little on the wobble and inclination of the earth as it is not completely spherical hence the amount of energy received is in slow flux but never mentioned 1-2% [guess]. A lot on the elliptical orbit which may vary the input up to 6% [guess]. A lot on the albedo which can vary markedly for a number of factors you are aware of -3 to + 6 [guess]. Conservation of energy and black body emissivity dictates that the energy we receive in 24 hours [rotation period of the earth +/_] should be equal. I cannot be more insistent on that. for the earth as a whole must be equal. I do not wish to nitpick on endogenous earth heat or energy trapped by chemical processes and photo-sensitivity, just the big picture. angech – I agree with you on most points. Where I disagree is that “Conservation of energy and black body emissivity dictates that the energy we receive in 24 hours [rotation period of the earth +/_] should be equal.”. No. Why pick a rotation period? It should be almost equal not just over 24 hours, but at all times, the surplus or deficit manifesting themselves as a (slight) warming or cooling. You have a great point regarding the albedo; I believe this is the main mechanism Mother Nature uses to stabilize the planet’s temperature. But there may be effects in infrared or UV that we don’t see and therefore consider..
Water can store heat, which means less current emissions on its way to the TOA. It can capture solar and hold it which moderates fluctuations. True. but energy in equal energy out. The total amount of energy in the sea/atmosphere/earth is a measure of the impedance of those mediums. The capacity to hold heat depends on the density of those mediums and their conductance and emissivity. at the end of 24 hours an ice block can only be an ice block if the local conditions are right. There is no extra energy ever stored in the system as a whole. I am an accountant so I see many things as they relate to accounting. The TOA primarily lets in solar energy. That is our revenue. Our spending is seen as TOA long wave emissions to space. The roughly 4 C the oceans have trapped is our savings account. It represents most of the past differences seen at the TOA. From time zero that’s all we’ve managed to hang on to. You are correct that everything that happens below the TOA basically zeros out, except for changes in our savings. Changes in savings is, though it’s hard to measure, directly proportional to changes in incoming and outgoing at the TOA. Above I disregarded the atmosphere, and ice due to their relatively low heat capacity. You are correct about heat diving into the North Atlantic or a Monster El Nino. Such changes do not instantaneously change anything, we’ll maybe albedo I guess. The system has the same amount of energy, it’s just shuffling it. Long term, a new sorting of energy is likely to change the system’s total heat. The TOA primarily lets in solar energy. WRONG! The TOA also lets out reflected solar (shortwave) energy..
Changes to how much is reflected are not directly correlated with changes to the energy of the system, but rather controlled, in a very complex way by changes to the details of its distribution. The assumption that those details will “cancel out” in any sort of averaging process is totally unwarranted. The ocean temps can be graphed with the Global Argo Marine Atlas and CERES data at CERES data products. All the ocean warming is in the southern hemisphere. 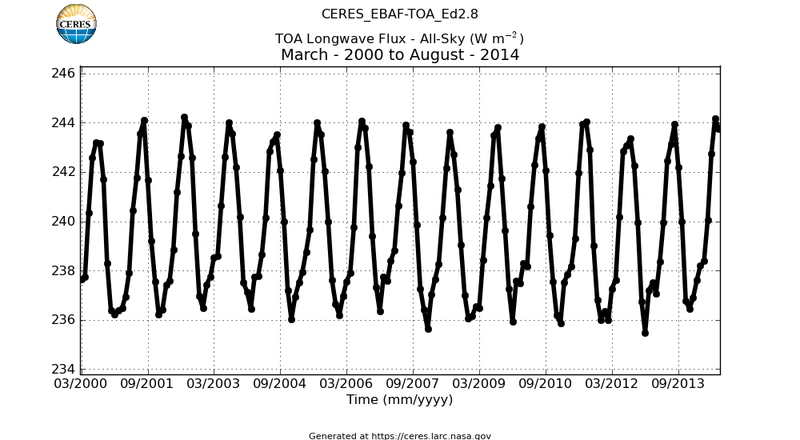 The annual peak in both net toa flux (positive warming) and ocean occur in January and February. These large changes in outgoing energy completely dominate – almost – changes in incoming energy. The changes in outgoing energy is the net change in out of phase changes in short wave and longwave variability. The out of phase changes are due to differences in land and ocean areas between the NH and SH. The ocean warming in the last couple of years is due in part to increase in solar intensity in the 11 year cycle. Water can store heat, which means less current emissions on its way to the TOA. Here’s what it looks like. Rob, are these variations in heat content purely due to the closeness of the sun to the earth in January/February? So it looks like it warms in the SH summer and cools in the NH summer. Mostly as a result of orbits. Pierre, the earth is in energy balance whether the sun is near or far. It has more energy coming in and going out so technically it does not gain energy. Planets that are nearer to the Sun (e.g. Mercury) are in energy balance at a higher temperature than planets that are further away (e.g Mars). It is precisely because they are warmer that they are in energy balance despite the larger solar power that they receive, as it enables them to radiate energy back to space also with a larger power. So, the Earth likewise can be expected to warm is it is nearer to the Sun (other things being equal), for the very same reason. Being nearer to the Sun makes the Earth (temporarily) more like Mercury and less like Mars. true it is warmer nearer the sun, but it is in energy balance,It’s warmth is a function of it’s distance from the sun not the fact that it is storing any new energy. Energy in equals energy out, the radiative temp is higher. Yes, ‘energy in’ = ‘energy out’ *after* it has achieved the surface temperature (and atmospheric temperature profile) that enables this planetary energy balance to be maintained. The change in surface temperature, while it occurs, also has an effect on the energy fluxes below the surface. In the oceans, for instance, the top 100m or so (on average) constitutes a well mixed layer. If the average sea surface temperature changes for a sustained period, then it must also warm (or cool) by nearly the same amount throughout this whole well mixed layer, and this temperature change throughout the volume of the well mixed layer entails a large change in heat content. As the energy in equals the energy out and can only change from solar position or level of radiation how could the sea store more energy? there is no extra energy to store. If GHG goes up as in CO2 It will have to heat the atmosphere a little first, then this will have to transfer to the top level of the sea and over many thousands of years the temperature will go up incrementally a hundredth of a degree if the CO2 was to stay around this long. The sea surface temperature changes we see are short term ephemeral in nature lasting 3-30 years with even a 100 year length only a twinkle of natural variability. Look at the immense amount of water that has to be heated up by that incredibly small amount of atmosphere and think a little. Why would you think the earth is in radiative balance? Paleo data (sealevel rise) suggest the earth is rarely in radiative balance. Anyway, it’s not just that the earth is closer to the sun, it’s that its lowest albeo regions are closest to the sun. The oceans in particular, which may not give up the heat immediately. Why would you think the earth is in radiative balance? Paleo data (seal evel rise) suggest the earth is rarely in radiative balance. Sorry, settled science, the real type, says energy in equals energy out. Whether the oceans are rising or falling whether the earth is hot or cold. The energy coming in from the sun daily equals the energy out. The earth is always in radiative balance. The amount of energy held by the atmosphere or oceans can vary immensely due to factors like cloud albedo and GHG while the earth remains in perfect radiative balance. DMI data on Arctic temperatures: Hide the Increase? While summer maximums have showed little trend, the annual average Arctic temperature has risen sharply in recent decades. This is indicated both by the GISS, DMI data and other high latitude data sets. On Misleading Comparisons between the Danish Meteorological Institute (DMI) Arctic Air Temperatures and the Goddard Institute of Space Science (GISS) Arctic Surface Temperature Anomalies, and Implications for Arctic Warming. A recent WUWT article by Frank Lansner, August 5th 2010 has the heading “DMI polar data shows cooler Arctic temperature since 1958”. Peter Berenyi also posted a similar chart here on Skeptical Science. Frank Lansnser goes on to show data from GISS July polar views (where individual grid cells show large variability) and compares this with graphics of DMI data for July 2010 to cast doubt on the validity of the GISS gridded values in the polar regions. This follows on from similar points made by Steve Goddard, on WUWT and another article by Harold Ambler which tries to show how DMI is based on more data measurements than GISS, followed by questions and implications about the reliability of GISS gridded values in the Arctic region. Similar claims that the DMI data shows Arctic “cooling” or highlights problems with other temperature data sets (eg from GISS, which mostly interpolates over the Arctic ice) appear on other websites. Many other articles have attempted to compare Arctic trends derived from satellite based microwave sensors with surface based (such as GISS) Arctic values, highlighting apparent differences. This post seeks to correct the public misunderstandings that these articles may cause, primarily about the claim of Arctic “cooling” but also about comparisons between the DMI 2m Arctic absolute temperature time series and GISS Arctic temperature anomaly data. In the following analysis all data is from original sources (such as DMI) rather than data “extracted” from web page graphics. The Danish Meteorological Institute (DMI) Arctic temperature data is an output of the latest operational model as used for meteorological forecasting by the European Centre for Medium-Range Weather Forecasts (ECMWF). This output is an average of all model points at 2m height, currently on a 0.5 degree grid over the most northerly part of the Arctic, above 80N. Because the number of land stations in the World Meteorological Organization (WMO) list above 80 degrees North is very small indeed (a handful), measured data inputs for the model must be supplemented by other sources for high resolution meteorological work. The models assimilate inputs from weather stations, drifting stations and buoys, radiosondes, aircraft, vessels and more recently infra-red and microwave satellite based sensors. The data is used to create a full three dimensional deterministic model of the global atmosphere which can be run forwards in time so that dynamic atmospheric conditions (weather) and regional climate can be analysed and forecast (or reanalyzed using historical observations as inputs) to the resolution limits of the model. The resolution of these operational models has continually increased to take advantage of increased computing power and higher spatial resolution satellite data. This means that the DMI Arctic temperature data has had several changes in its history. Between 1958 and 2002, the output of the ECMWF 40 year reanalysis (ERA-40) is used, (approximately 120km grid horizontal resolution). The ERA-40 re-analysis itself has three main sections of assimilated data, using pre-satellite observations up to 1972, then assimilating some satellite sensor observations, starting with the Vertical Temperature Profile Radiometer (VTPR) on early NOAA satellites, up to 1987/1988, and then using more recent observation types and more satellite sensors, both Infra Red and Microwave, in combined sensor packages such as the Television Infrared Observation Satellite (TIROS) Operational Vertical Sounder (TOVS), Special Sensor Microwave/Imager (SSM/I), Advanced TIROS Operational Vertical Sounder (ATOVS) amongst others, on platforms like the ERS (European Remote Sensing Satellite) and later NOAA series of satellites from 1987 onwards. In 2002 the DMI data switches to a higher resolution T511 model (40km resolution), then in 2006 to T799, (25km) and from 26th Jan 2010, T1279 (16km). These changes could be linked to minor differences in the apparent Summer melt temperature, (there are small differences between the ERA-40 and the T511 outputs in the overlap period in 2002). In general the satellite data has almost full polar coverage and very high spatial resolution, but lower absolute accuracy over ice. For surface measurements Infra red satellite sensors are used as they measure the infra-red energy (Long wave radiation) emitted directly from the Earths surface (skin temperature). Large bias differences exist in uncalibrated absolute surface temperature estimates from some of the different satellite sensors, eg Lakshmi 2002 discusses global differences between TOVS and Advanced Very High Resolution Radiometer (AVHRR) data. These longer time series from equivalent satellite sensors are themselves made up of data from several (not necessarily overlapping) satellite missions, so care must be taken when analyzing long term trends (see analysis of calibration of TOVS data for some visual representations and context). Direct comparisons of measurements from surface based sensors and remote sensors like the more recent Moderate Resolution Imaging Spectroradiometer (MODIS) on the TERRA and AQUA satellite platforms show that cloud cover can bias infra red Arctic surface temperature measurements low, for example see Hall 2004 on MODIS Sea Ice Surface Temperature, Scambos 2006 on validation of AVHRR and MODIS ice surface temperature, Randriamampianina 2009 on assimilating ATOVs data in Polar regions, and Koenig 2010 on MODIS data compared with high accuracy surface-based thermochron sensor data on Greenland). However, although work is always ongoing to reduce errors, the models allow this high resolution data to be used to interpolate between the sparse but very accurate observations from land stations, which form a network of absolute temperature value “tie points” – allowing bias calibration of the fine scale overall satellite derived relative changes. In general, the skill of such high resolution models to match observations has improved incrementally with each step increase in resolution. Nevertheless DMI recommend that the 2m Arctic air temperature data should not be compared with overall Arctic temperature estimates from other data sets, which generally cover a wider area (usually above the Arctic Circle at approximately 66N) where more land station data is available. Despite this, the DMI data has been used as a reference for comparison. Most of the area above 80N is (currently) still covered in permanent sea ice. In the Arctic Summer when the surface ice is melting, the air temperature close to the surface is limited by this ice melt temperature to just above zero degrees C (Rigor 2000). This is why the Summer air temperatures have not varied much over the entire instrumental period. This maximum temperature “clipping” effect is clearly seen on the following chart which shows measured 2m air temperature data from former USSR Polar Stations NP-6 and NP-30 from positions above 80N (see Lindsay 1998 for more detail). Data from these “North Pole” (NP) stations is considered to be the most accurate Surface Air Temperature (SAT) data from the Arctic Ocean. This behavior is also clear in all other polar data sets including those from the International Arctic Buoy Programme (IABP), individual stations (such as Eureka, see Lesins 2010), Surface data AVHRR infra red sensors (carried on various satellites from TIROS-N in late 1978 to the current NOAA series of satellites), see Comiso 2006 (figure 2). The zero degrees Summer melt maximum is consistent enough to be used to calibrate Arctic temperature sensors suspected of bias (see Rigor 2000 figure 4). It is therefore not surprising that this limiting effect is also apparent on the gridded DMI data, here monthly (30 day) rolling averages, averaged decadally for clarity (the zero limit is less “flat-topped” in this case partly due to the averaging of data over 10 degrees of latitude). This pattern is likely to prevail whilst substantial permanent sea ice remains above 80N. Clearly high Arctic Summer surface temperatures just above zero are not really an indication of anything except proximity to a melting ice surface. To claim that the Arctic is cooling based on Summer surface temperature values over sea ice is to misunderstand the data. It is also evident in all of these Arctic data sets that the average temperatures in Winter, Spring and Autumn have generally increased over the measurement period. It appears that the overall seasonal cycle is riding on a gradually warming average value, but peak positive excursions are being limited by the ice melt temperature in Summer. It would be intuitive that these seasonal warming patterns would affect the overall DMI temperature anomaly trend, and this is the case. If we plot the entire daily DMI temperature data, and then a 365 day rolling average, and calculate a linear best fit, we end with a positive trend of 0.383 degrees C per decade. Thus the reality is that the annual average temperature as indicated by DMI has risen at rates around twice the global average over the past 50 years, which is entirely consistent with other Arctic data sets, including the data from GISS. If we plot this average positive trend and five year running averages on the same vertical scale below (red) it gives clearer context to the Lansner chart of Summer melt average temperatures (green). The Goddard Institute of Space Science (GISS) global surface temperature anomaly series is based on observations rather than models. Its primary usefulness is as a constantly updated indicator of global or large scale regional surface temperature changes. It uses a publicly available global surface temperature data set of over 6000 ground stations on land, from the Global Historical Climatology Network (GHCN), and Antarctic data from Scientific Committee on Antarctic Research (SCAR), and two different publicly available SST (Sea Surface Temperature) data sets, the Met Office Hadley Centre’s Sea Ice and Sea Surface Temperature data set (HadISST1) up to 1982 (vessel based) and the National Oceanographic and Atmospheric Agency (NOAA) Reynolds Optimum Interpolation Sea Surface Temperature analysis (OISSTv2) subsequently, the latter being mainly satellite based. These values are also cross checked against other available data sets and satellite data sets. The measurements used by GISS are gridded at either 1200km or 250km resolution, with appropriate weighting in grid cells containing both land and ocean. The SST data where available is used up to 100km from any coast, but data from any source is extended to a maximum radius of 1200km if no other measured data points are present within this range. For the high Arctic, we have already noted that there are relatively few land stations, (a handful above 80N), and most of this area is currently still covered by permanent sea ice. A study using data from stations and Polar drifting ice buoys showed that near surface air temperatures over the pack ice are relatively homogenous, with a CLS (correlation length scale) of 900-1000 km (Rigor 2000). Though this can reduce slightly in the Summer between the coast and ice covered areas. Obviously SST can not be used in this region, as the sea surface is frozen. In many data sets, models and re-analyses, it is standard to set SST to freezing point of sea water (around -1.8 degrees C) where there is >90% ice cover eg HadISST1 (described in Rayner 2003) or recent NOAA SST modeling which uses fixed and drifting buoys, ship and surface station and satellite data (currently from NOAA-18 AVHRR and the European Meteorological Operational Satellite Programme (METOP-A). In open Ocean SST tracks variations in Air temperature, but this is not the case near the transitional and mobile ice “boundaries”. This is one reason why GISS does not currently use SST data in the seasonal ice region above 75N, even when this data is seasonally available, – as is increasingly the case due to diminishing trends in ice extent, and better coverage due to satellite data. See current data from the National Snow and Ice Data Centre (NSIDC). However, the data is treated consistently over the longer term, which is very important for trend analysis. This means in the Arctic region, GISS data is relatively coarse grained, as individual grid cells above 80N may include station data interpolated out to as much as 1200km, and are likely to show the higher short term variability which is characteristic of data from individual Polar stations. However, given all of the above, and the significant differences in horizontal resolution, and methodology, and the caveats and cautions from both DMI and GISS, how do monthly or annual time series compare? Here the annual average values for each year have been plotted for both the polar “zonal” GISS data (64-90N) and the DMI Arctic data, and the trends calculated for both data sets for the full DMI period. Note the relatively high variability in both polar data sets compared with the “global” or “northern hemisphere” averages. At this resolution the correlation between DMI and GISS averages is reasonable, and the 50 year gradients are statistically indistinguishable. These trend figures are also consistent with those from a recent comprehensive surface data based study of the Arctic (Bekryaev 2010) which gives 0.364 degrees C/decade from 60-90N over this same period. Zooming to higher resolution and using Monthly GISS average gridded values (light blue) above 80N to plot a 12 month rolling average (dark blue), and using the DMI daily values to plot an equivalent 365 day rolling average (pink), we can see that there is good correlation of the high resolution model based DMI values and the lower spatial resolution GISS data, and the significant positive temperature trends are again consistent. What Lansner (and others) have effectively done is to pick one of the peak monthly GISS values (light blue) and compared the average DMI value for that month. Clearly this is likely to give a misleading result (as it would with any monthly sample from any Arctic data set) when compared to the overall records. Is the GISS Arctic data consistent with other studies of Arctic temperature trends and other data sources? The former USSR polar ice station programme and IABP programme give 2m air temperature data from the high Arctic. There are also a few other high Arctic stations with limited data. Several attempts have been made to homogenize and assimilate these data sets into a common Arctic time series. One example is Polyakov 2002. The associated data is available from the International Arctic Research Centre (IARC) at the University of Alaska Fairbanks). It is no surprise that temperature data from before the ice buoy and drifting station programs should be consistent in both this data set and GISS, as they are based on identical station data. Comparing the results with GISS over the same grid area over dates where the recent ice station and buoy data is used, the correlation is just as high. What about the other observation based data sets, and other independent satellite data? Monthly averaged global data sets often cited and discussed are (HadCRUT3 from the UK Met Office Hadley Centre in conjunction with the Climate Research Unit (CRU) and the Lower Troposphere weighted values from combined satellite Microwave Sounder Unit (MSU) and Advanced MSU (AMSU) time series from the teams at Remote Sensing Systems (RSS) and University of Alabama in Huntsville (UAH). Microwave “sounders” (see Waters 1975) measure microwave radiation at multiple characteristic frequencies, each emitted from specific components (eg Oxygen molecules) of the atmosphere which are present in different relatively broad vertical “profiles” within the overall atmospheric column. They do not directly measure surface temperature. Absolute values show less seasonal variation than at the surface, whilst the annual average temperatures are a few degrees colder. 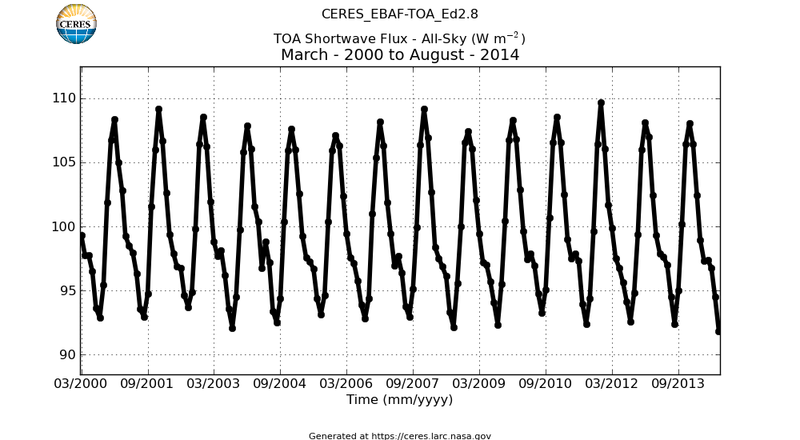 The Lower Troposphere MSU time series are made up of data from several similar sensors on overlapping satellite missions. An excellent graphical overview of these missions and updated recalibrated results are given on the NOAA site for Microwave Sounding Calibration and Trend (MSCAT). A superficial analysis of publicly available “Arctic” subsets of these data series indicates that whilst all data sets show strong warming, there are differences in positive gradient between data sets over the satellite measurement period. The interpolated GISS 64-90N product gives 0.62 degrees C/decade over the satellite period (since 1979), UAH North Polar subset is 0.47 degrees C/decade, HadCRUT3 from 65-90N gives 0.45 degrees C/decade, and RSS from 60-82.5N gives 0.34 degrees C/decade. All of these data sets should be used with caution when making comparisons at high latitudes, as they do not have identical coverage. HadCRUT3 uses a similar gridded format to GISS, but a different methodology which does not include extrapolated Arctic grid cell values. Care is also advised in the use of MSU data at high latitudes due to MSU sensor scanning geometry, for example the standard zonal “polar” data from RSS covers from 60N to 82.5N. Data above this latitude is considered unreliable, and is not available. If the data from each global data set is gridded over approximately equal Arctic areas then the differences reduce to well within the error bars of the data. From the above discussion we see relatively small changes in latitudinal extent can significantly affect the trends of average gridded values in the polar region. This is because of the strong increase in temperature anomaly trends as we approach the poles, particularly at high Northern latitudes. This gradient (Arctic amplification) has increased in recent decades, for example see (Vinnikov 2006 and more recently Zou 2009 on ongoing MSU intercalibration efforts, where figure 9 shows the significant warming trend gradient with latitude (as measured with MSU), with temperature anomaly trends between 0.7 and 0.8 degrees C/decade above 80N for the 1987 to 2006 period. To help visualize this, the trend values for 10 degree latitudinal zones for GISS Land and Ocean, RSS Lower Troposphere and the latest ERA-Interim re-analysis surface temperature over the last thirty (where available) and last twenty years are shown below. For context the GISS trend values for 64 to 90N are given as 0.62 degrees/decade since 1979, The DMI trend for above 80N over the same period is 0.68 degrees C/decade. The comprehensive surface station data based on Bakyraev 2010 gives 0.639 degrees C/decade for 60-90N between 1979 and 2009. The full coverage AVHRR decadal trend from 1981 to 2005 is 0.61 degrees/decade above 60 degrees N, but 0.72 degrees C/decade inside the Arctic Circle (around 66 N) whilst the IABP polar buoy data set gives 0.88 degrees C/decade between 1979 and 1999 for measurements which are (mostly) well inside 80N. The newly available (2009) and updated high resolution ERA Interim re-analysis gives even higher trend values between 70-90N of around 1.0 degrees C/decade over the twenty year 1989 to 2010 period at the surface, where warming has been shown to be strongest (see Screen and Simmonds 2010). If the ERA-interim product is spliced with ERA-40 (to minimize differences in the overlap period) the result for the surface gives 0.78 degrees C/decade between 1979 and 2010 which is consistent with the values above over the same three decade period. Thus conclusions from an objective analysis of available data, and recent peer reviewed work, whether based on updated independent observations at various resolutions, or state of the art high resolution climate modeling using all available data sources, is that the Arctic is experiencing strong warming, roughly double the global average, and showing increasing surface temperature trends with higher latitude. Whilst some caution is advised by GISS in using the interpolated data in the Arctic region, it appears that GISS trends in the Arctic region as a whole are consistent with other high latitude data sets, and show similar trends (in terms of annual averaged values) with other data sets which cover the region above 80N. Aug 5th, 2010 @ 12:53 pm › Roy W. Spencer, Ph. D.
“Surface Air Temperatures above the Melting Ice in the Arctic Summer – Most of the area above 80N is (currently) still covered in permanent sea ice. In the Arctic Summer when the surface ice is melting, the air temperature close to the surface is limited by this ice melt temperature to just above zero degrees C”. I had not realized this very curious fact. So how does the Arctic warm at 8 times the rate of the rest of the world given this curious fact. Particularly as it cannot warm [for the last 2 years in particular] beyond the freezing point at the hottest part of the year! And why do we need Krigging to infill an area that cannot get hotter in Summer, when all you need is a satellite area map x 0 degrees for the most important 3 months. You do not need weather stations! It raises serious doubts that claimed x8 warming in the coldest part of the year in the Arctic can possibly generate enough heat to explain away the pause. Keith Woollard said You lose me at the first graph. If you use the satellite data you cannot make any of the points you raise. I’m curious, why aren’t they using the satellite data? The issue is that claims like “there’s been no warming since 1998” relate to the satellite data which do show a pause for that time no matter how you try to deny it. You cannot both incorporate satellite data and then dismiss it. Argo And Ocean Heat ContentThe earth is closest to the sun in January, so the earth gains energy around that time, and loses it in the other half of the year. please QUOTE THE EXACT WORDS YOU DISAGREE WITH.